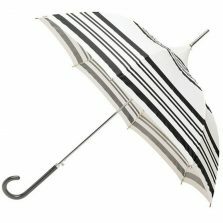 Introducing this stunning addition to our recently extended range of pagoda umbrellas, the pagoda Candy Stripe umbrella. 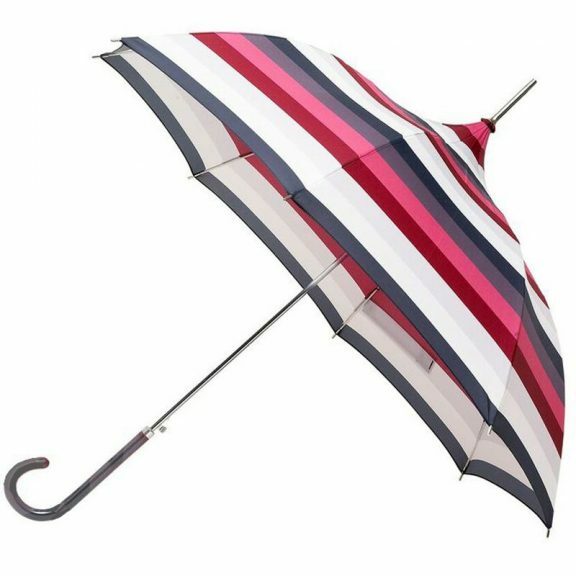 The Candy Stripe umbrella surely has to be one of the prettiest umbrellas in the world. It’s distinctive pagoda shaped canopy features horizontal “blush stripes” in a mix of striking, contrasting colours. 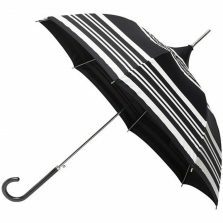 The canopy of the Pagoda Candy Stripe Umbrella is polyester, and when open has a span of 90 cm. That’s 90 cm of loveliness to show off as you are out and about on a rainy day. The length of the umbrella from tip to handle is 90 cm. Also, it has an elegant steel tip and a grey fabric covered elegant crook handle. Not only this, but it is also an automatic opening umbrella. Meaning that when the skies cloud over and the heavens open you can be safe and dry at the push of a button. 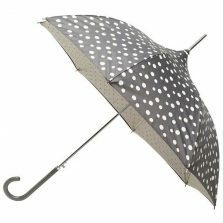 In fact you will safe, dry and extremely stylish under your charming brolly. Perfect to accompany your special outfit to events such as weddings, a day at the races, regattas, garden parties etc. 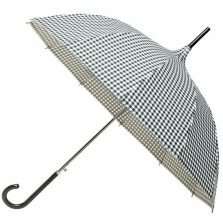 If you’re looking for something a little bit different or unsure of which colour to go for, this perfect pagoda umbrella might be the one for you. The bold stripes will have you blushing with pride on a grey day. The gorgeous umbrella is just one of our large collection of ladies pagoda umbrellas. This is a style which has been gaining more and more popularity over the last few years and we are very proud of our contribution to this growing trend. If you would like to see some more of these stunning creations simply click and see our pagoda umbrellas! We also have an vast collection of wedding umbrellas here at Umbrella Heaven. Many of these are also pagoda style and will compliment you, protect your hair, and what is probably the most precious dress you will ever purchase. 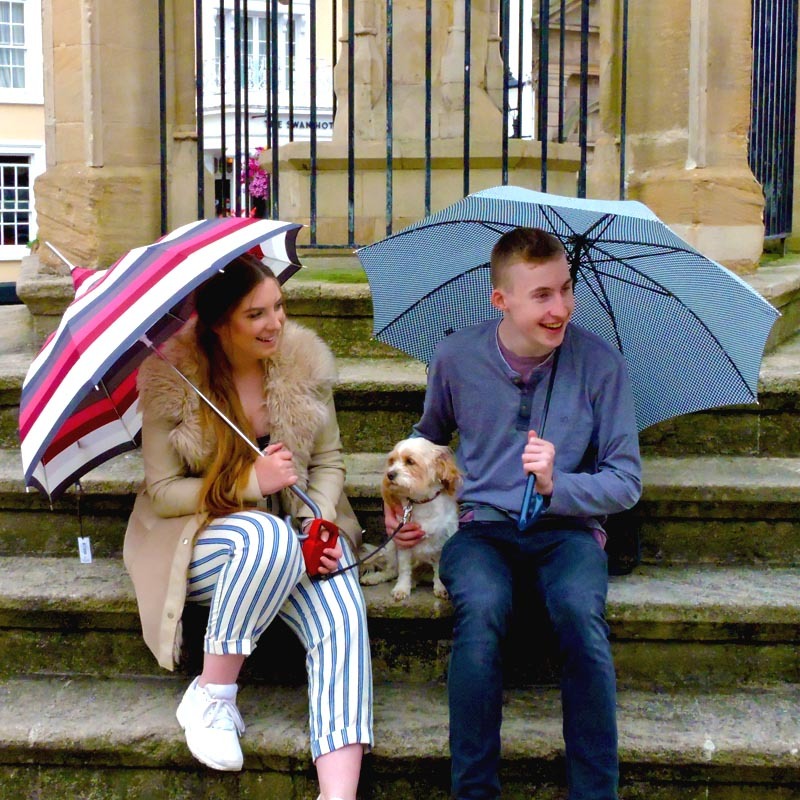 Click and see our wedding umbrellas!